✔ Free & Unlimited App, Wallpaper and Ringtone Resources. 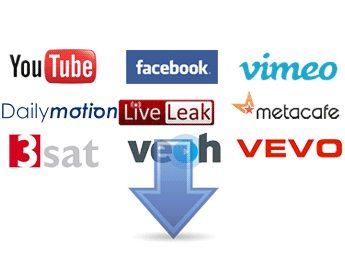 ✔ Download videos from 100+ video sharing sites. 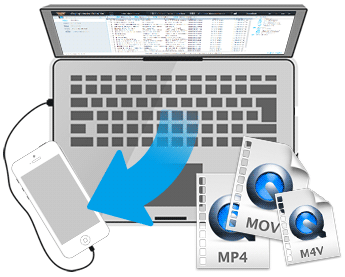 ✔ Free File Transer Between iPad/iPhone/iPod/Android and PC. 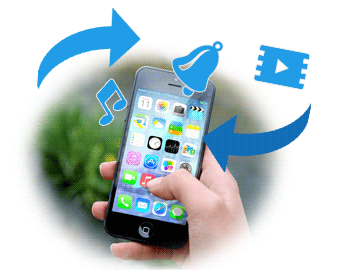 ✔ Handy toolkit: Audio/video converter, ringtone maker, etc. ✔ No Jailbroken Devices Needed. iOS 12 & Android 9.0 Supported. * This free iOS & Android manager is fully compatible with the latest iTunes 12.9. and supports the latest iPhone XS Max/XS/XR, iPhone X, Samsung Galaxy S10/S10 Plus/S10e. Syncios gives you a quick way to download rogue iOS apps without jailbreaking your device. If you've got your eye on an app that isn't available from the iTunes store, this download will help you get it on all of your iOS devices. 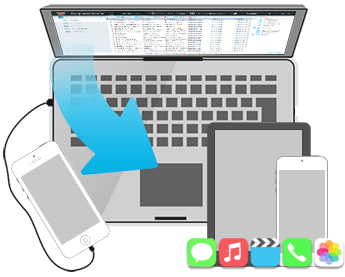 In addition, it works as a device manager so you can easily sync media files between your iOS/Android device and PC. 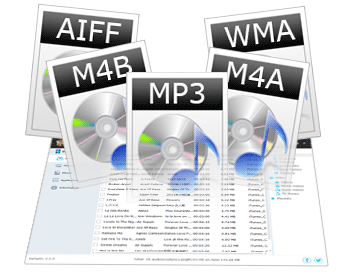 Backup all the audio files including music (*.MP3, *.M4A, *.WAV, *.AIFF), ringtone (*.M4R), audiobooks (*.M4B), TV Shows from iPod/iPhone/iPad/Android to PC. Add local music files from computer to iOS/Android Devices, delete or export audio files, add playlist. All the information about album, duration, artists, size will show on the center panel. 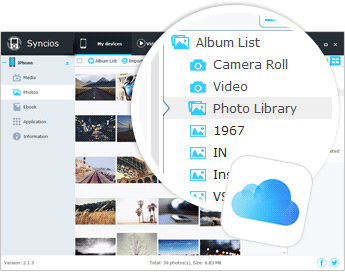 Transfer camera roll and photo albums with Syncios for free. you can export camera roll from iPod/iPhone/iPad/Android to local computer as well as create a new album which enables you to delete or to export images, videos, transfer local images between iPod/iPhone/iPad/Android and PC. Syncios's intuitive videos transfer wizard makes it super easy to copy any specific selection or a whole library of videos, movies, podcasts, TV shows and audiobooks. Video files' thumbnails will be displayed on the program panel. Want to transfer and manage ebooks on your iOS/Android devices as you like? 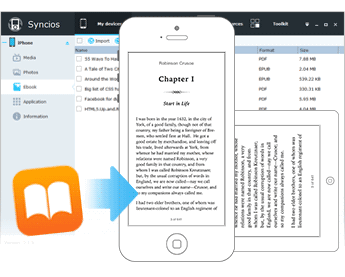 With Syncios, you can transfer any ebook in Epub/PDF quickly and easily with just a few clicks. It allows you to add, delete or backup your local eBooks seamlessly between computers and iOS/Android Devices. Now, there is no need to copy music back to your PC to play it. With Syncios, you can play music directly from your iOS/Android Devices. Even create new playlist to organize your audio and video files, and edit playlists for your iPod/iPhone/iPad/Android, transfer files between iOS/Android Devices and PC are all allowed. 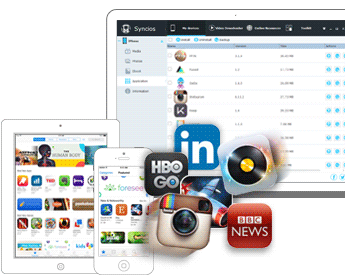 As an iOS&Android manager, Syncios supports installing application (*.ipa) from local PC to iPod/iPhone/iPad/Android. You can also backup Apps to local PC or uninstall the application directly from iOS/Android Devices. If you want to see the application’s information, go to Installed application panel, all the apps’ information such as name, version, size, etc. Built-in online resource center providing access to the vast resources, intelligently discover and download ringtones, text tones and wallpaper. Did you know that you can get wallpapers directly on your phone? You can easily download high resolution wallpaper that have been resized and cropped to fit your iPhone, iPod, iPad or Android phone. You can also get unlimited free ringtones and text tones for your phone. 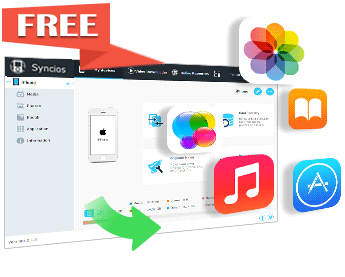 Syncios provides an easy solution to download videos from YouTube and 100+ sites, including YouTube, Facebook, Dailymotion, Vimeo, Metacafe, Howcast, Niconico and more without involving iTunes. Specify the quality level or video format you want to download. Convert and transfer video downloaded to iPad/iPhone/iPod/Android for watching without Internet with ease. 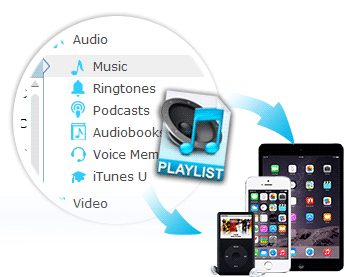 Convert and enjoy music, ringtones, video in unsupported format on iPad, iPhone, iPod, Android conveniently. Converting and transferring files could be wonderfully accomplished! Make your own free ringtones from your favorite music without ever buying from iTunes Store with Ringtone Maker. You can also make free text tone with this ringtone maker tool. Connect and manage multiple devices simultaneously is also possible which makes it easy to share and transfer files between iOS/Android Devices & PC. You can share music between Two devices. Besides, Syncios iOS&Android Manager allow you to access iOS file system: no license or registration is necessary to enjoy file transferring. You can use your iOS device as an external USB Key for extra convenient storage.